Who doesn't love Thai Food and for Bangkok Food Lovers, you're going to be in for a special treat as we take you on a journey to discover the delights of what it's really like to sample some of the country's authentic Thai cuisine? Not only that, you'll also get a taste of some of the crème de la crème gourmet Thai cuisine all the way down to the tastiest street food Bangkok has to offer. Vegans, vegetarians, seafood lovers and meat eaters are all very welcome. I have partnered with a tour company that offers you a great many foodie options in and around the city of Bangkok. Below you'll find several guided tours in which to choose. And should you require any further foodie information, please don't hesitate to contact me. Shall we get cracking as I'm sure you and I cannot wait to see and taste everything Bangkok has in store for us? We'll also go off the grid on a private food adventure and a Thai Tapas Food experience. Are you ready? Are you excited? Are you hungry? Then let's get started. 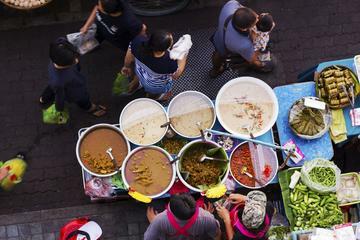 We have a lot of ground to cover as we tackle the Bangkok food market. Give your taste buds a real treat with this delicious foodie tour of Bangkok and savour the best in Thai cuisine while munching your way through the capital. On this tour, you'll learn all about Thai curries. You'll also be cruising the Chao Phaya River on a traditional rice barge as well as experiencing a mesmerising Thai dance show while selecting your favourite Thai food from an extensive menu. On this superb four-day tour, you'll also get to enjoy an extremely fun and interactive Thai cookery lesson. The tour groups here will vary in size but they are typically made up of about six to ten travellers. Before you take another bite of bad Pad Thai food in Bangkok’s old town, let me show you where to get some really tasty local food, just a few streets away from the backpacker's haven in Khao San Road. You can always take a walk down Khao San Road on another day. Our Bangkok food tour will take you around the Bang Lamphu and Ban Phan Thom neighbourhoods, showing you where the locals like to eat. With our local guide by your side, you’ll duck down alleyways into hidden restaurants, chat with food cart owners and taste authentic Thai dishes you’ll never see on any tourist menus. So, who’s hungry? 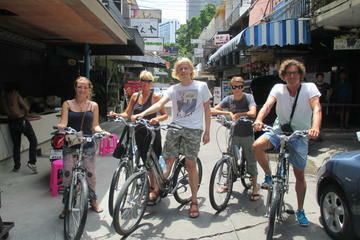 For three hours, come and join us as we discover the hidden gems of Bangkok with a local guide. 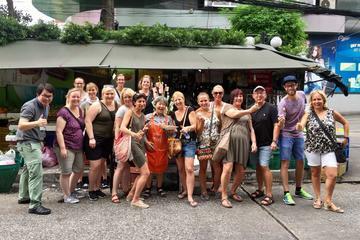 During the tour, our guide will take you to experience the local life and navigate the neighbourhood food as we visit food stalls and small venues beloved by the Thai people who live in this district. Join us on this half-day food tour as we take you into the heart of the historical and enchanting area of Bangkok. 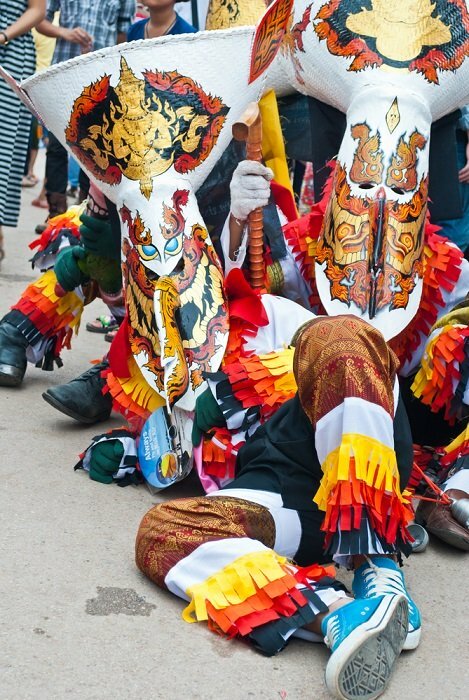 You'll be visiting the old world charm of Chinatown as well as the Village of Love in the Bangrak district of the city. We'll pick you up from your hotel and take you on a food tasting tour you won't ever want to miss. You'll get to visit the local markets and curry shops. You'll sample a famous Thai milk tea drink as well as taste traditional Thai desserts, fruits and several kinds of Thai foods including Papaya Salad, lemongrass salad, sticky rice as well as fried pork, chicken or beef with basil leaves. You'll be driven to Chinatown by Tuk-Tuk (What fun that's going to be) where you'll experience Chinese ascendancy coupled with a touch of traditional Thai culture. You'll visit the Chinese Monastery and taste traditional Thai-Chinese Tea and coffee in a hidden area of Chinatown as well a trip to the Michelin Guide Bangkok Restaurant where you can taste the famous rice noodle roll with pepper soup. By now, I would imagine your taste buds will be tingling and that you cannot wait to embark on this mouth-watering tour. 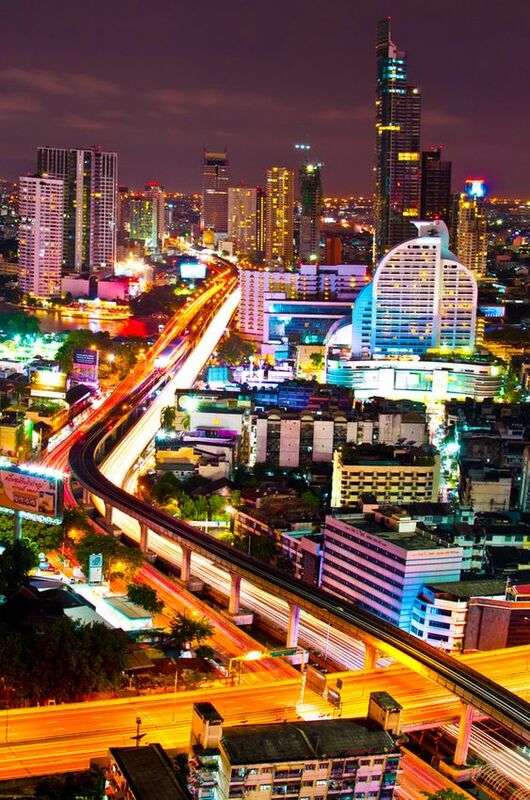 Come and experience Bangkok at its tastiest with a four-hour food tour under the stars. Buzz through the bustling streets of Bangkok by tuk-tuk to local eateries, from street food markets to foodie favourites. Your guide will ensure that you get to taste the best of Thai cooking including a cocktail sipped on the banks of the Chao Phraya River. You'll do it all under the cover of darkness in the hours leading up to midnight and experience a truly magical side of this amazing city. 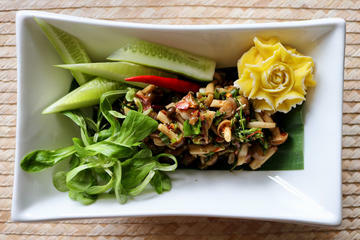 Have you ever thought about joining a Thai Tapas tour by bicycle? If you are the adventurous type, this leisurely tour by bike will give you a wonderful insight into the authentic Thai kitchen arena. It is here where freshly made specialities from all over the country will amaze you with their many different varieties, flavours and aromas. Your host on this Bangkok food tour is Mor. She's a Bangkok native who discovered her passion for cooking while watching her mother cook simple yet flavourful Thai dishes. Mor has traveled the world and draws inspiration for her dishes from the various cuisines she explores. 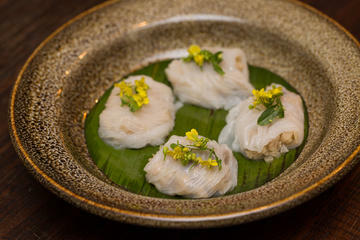 Mor has an artistic eye for creative plating and has developed her presentation techniques while apprenticing with a popular Thai chef in Bangkok. This is a wonderfu opportunity for you to join Mor in her kitchen and watch as she masterfully creates three of the gourmet Thai dishes you'll be enjoying during the time you spend here. 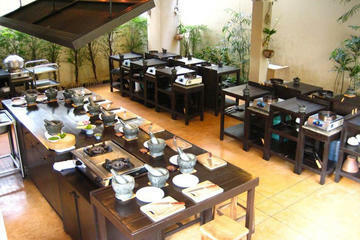 Mor offers a cooking demo that lasts about an hour before you sit down to share the meal. Mor will describe the ingredients and techniques involved in creating these sumptuous dishes and you'll also have the unique opportunity to watch and learn as local ingredients are transformed into a contemporary Thai meal. Please note that Mor offers a cooking demonstration and not an actual hands-on cooking class. Your host on this Bangkok food tour is Somkid. Please do come and join him in his kitchen and participate in a hands-on cooking class at his Bangkok condo that has an amazing view of the city. Somkid's time as a professional chef really shines through as he shows you how to delicately cut each ingredient, not only to bring out its flavour but also to serve in an aesthetically pleasing way. 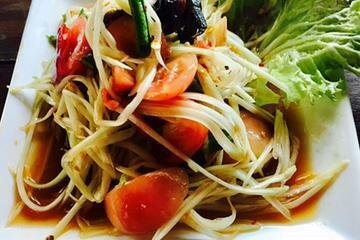 Some of the dishes you can expect from Somkid include vegetable tempura made with flowers, colourful tamarind soup as well as a sticky minced meat salad known as Larp. Somkid also exudes his creativity in inventing all sorts of curries. End your meal with a sweet Thai dessert such as sticky rice with mango known as Khao Niao Mamuang. This is a wonderful opportunity to learn from a professional local guy and catch a glimpse of true Thai culture through its cuisine.